Born in Lima, Peru, Rosalind spent her early childhood in an isolated community high in the Andes on a ranch managed by her father. This culture was conducive to creativity as well as giving Rosalind a love for varied peoples which are often evident in her bronze sculptures. Rosalind received a degree is Special Education for the Blind and Visually Impaired from the University of Texas in Austin. This training developed not only a love for children with special needs, but also a keen awareness of shape, form, and texture. Rosalind married Hal Cook in 1970. When she was pregnant with their first child, she took a sculpting class which she describes as the "ah-ha" of her life. Sculpting remained only a hobby as she raised three children. As the children grew to need her less Rosalind began taking workshops with sculptors whose works she admired and respected. Filling the empty holes of her art education, Rosalind took two years of anatomy. She began casting works in bronze in the 1980s and knew it was a calling on her life. Rosalind attributes a study trip to Italy to explore the works of the Renaissance master artists as one of the greatest influences in her development as a sculptor and her works began to reflect the benefit of all of these studies. Quickly her career began to flourish through select gallery representations, shows, and notable public commissions for hospitals, libraries, parks, and corporate headquarters across the country. Rosalind is a believer in using gifts and talents to benefit others. Her work annually raises large funds for nonprofits she supports. Teaching annually is a part of sharing her gifts as well as her personal growth. Rosalind began "The Rosalind Cook Encouragement Award", a foundation which provides public school art teachers funds for art supplies and to purchase equipment for innovative art programs. Rosalind sold her home and studio in 2014. She and Hal moved to Crested Butte, Colorado, as all of their children and grandchildren live in Denver. She continues to sell her bronzes from her website and creating sculpture commissions. "A strong design and composition is the key to a successful sculpture. My work is most recognized by the faces and the flowing forms of my sculptures. My goal is to capture the spirit of my subject, be it joyful, peaceful, animated, etc. I see my sculptures as a way to communicate with a viewer and hopefully celebrate the human spirit with them." Children, religious figures, peoples of varied cultures and races are prominent subjects of my bronze sculptures. The varieties of these subjects constantly challenge me as an artist. Often I build symbolism into a sculpture to enhance its meaning. For example, my children are almost always barefooted which symbolizes their unencumbered and innocent spirits. If the sculpture is commissioned for a specific business, church, or organization, the sculpture will reflect their particular mission statement in obvious content and in symbolism. My sculptures range in size from eight inches through to monumental. In addition to private homes, my work is frequently placed in: churches, libraries, schools, hospitals, and the headquarters of non-profit organizations, private and public businesses. I am deeply touched that my sculptures can convey to the public the purpose of that particular organization or business. It is another way that I know that my bronze sculptures have ongoing significance. 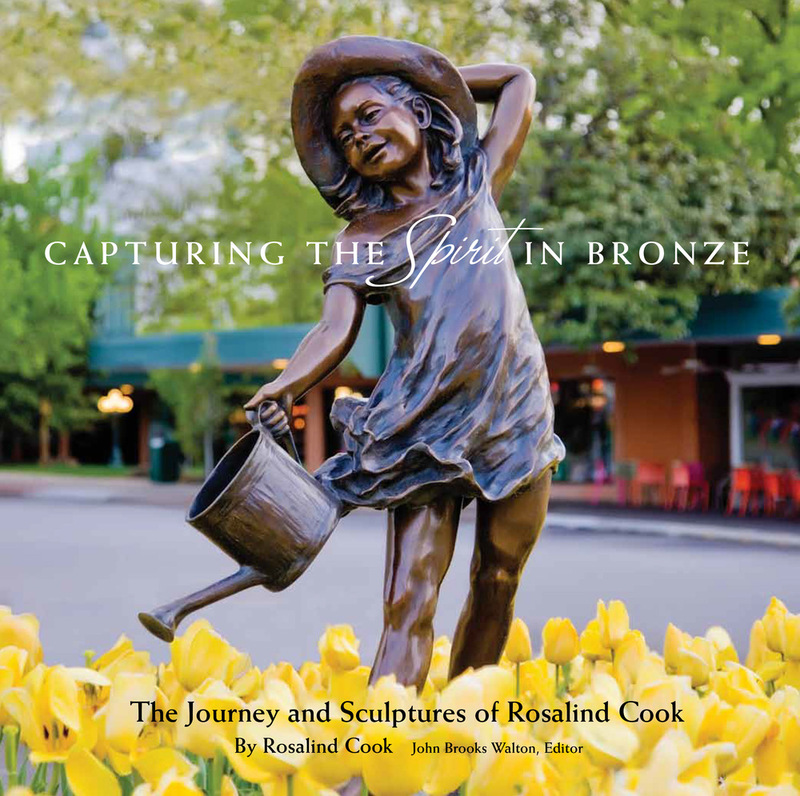 Rosalind's book, Capturing the Spirit in Bronze, The Journey and Sculptures of Rosalind Cook. In this beautifully illustrated book Rosalind shares about her life, her career and the amazing stories and inspirations behind each of her sculptures.